Another IMAX documentary is in the works for Blu-ray this July. 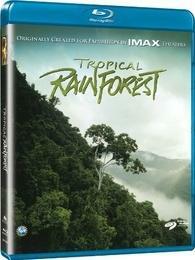 In an early announcement to retailers, Inception Media has listed 'Tropical Rainforest' for Blu-ray on July 12. The program explores the tropical rainforests of Australia, Costa Rica, Malaysia, and more and is narrated by Geoffrey Holder ('Charlie and the Chocolate Factory') and features a music score by the Grammy Award-winning South African men's choral group, Ladysmith Black Mambazo. Specs and supplements still haven't been revealed yet, but suggested list price is only $19.98. You can find the latest specs for 'Tropical Rainforest' linked from our Blu-ray Release Schedule, where it's indexed under July 12.